Well, 2017 was a great and interesting year, but I am happy to begin 2018 with a fresh outlook and optimism. I ended the year with a bang, including my re-election to Canton City Council and a trip to Spain for the holidays! Not a bad way to wrap things up. I was overwhelmed with the outstanding support I received during my campaign, and the results were humbling. I look forward to serving our citizens for another four years, and I am proud of the work that has been accomplished to date. Most everyone is genuinely excited about the city’s direction and momentum, and we’ve only just begun. We recently held our annual City Council planning retreat for the year in Columbus, Ga. One of the primary reasons for the location was to review and observe the excellent work that city has done with their Riverwalk. As I mentioned last year, our mayor and council have made the Etowah River one of our primary focuses going forward. We are in the process of extending our trails along the river to connect Etowah, Heritage and Boling parks, in addition to an extension to the east on the 45 acres acquired from the county in 2016. We also are seeking to create a master plan for high-quality development along the river, with new projects along the way. In addition to the river, the city also is hoping to complete the exterior restoration of the Jones Mercantile Building to its 1920s era by late spring. This is very exciting, and I look forward to having this historic building as the focal point of downtown Canton once again. We are contemplating the best possible use for the building and should have a plan in the coming months. Needless to say, there are a lot of exciting possibilities to consider. With all of the exciting projects in process, there is also a lot of work being done on infrastructure and other less glamorous initiatives. We are completing our master plan for water and sewer, and it will guide our decisions regarding future facility needs and service areas. These vital resources are essential elements to economic and residential growth projections. On the topic of growth, the mayor and council are working hard to ensure a “quality over quantity” strategy, and future growth issues will influence many of our decisions. With all of the excitement the spring and summer offers, we must first get through the winter. The early December snow was quite a surprise, and who knows what’s in store in the weeks ahead. Regardless of the weather, warm and soothing comfort food is essential during these cold months. I love cooking winter comfort foods, and there is nothing better than being in a warm kitchen when it is freezing outside. There are so many good options, such as soups, stews and casseroles. 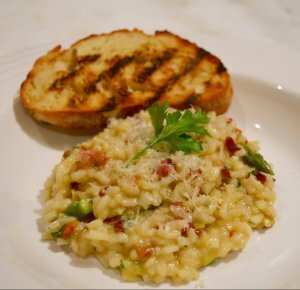 One of my favorite cool weather dishes is risotto. Even though it seems to get contestants eliminated on “Top Chef,” I always have found it easy to prepare. It just requires a bit of patience, adding the liquid a little at a time until fully absorbed. Like all pasta, I prefer my risotto on the al dente side. A bowl of mushy risotto is not a good thing, so just take it low and slow. Once you’ve mastered the art, you can adapt your recipes for this dish in countless ways. One of my favorite versions is made with leeks, pancetta and asparagus tips, but you can eliminate the pancetta or use any other vegetables – just use the best ingredients possible. I hope you find this recipe to be as warm and comforting as I do, and I wish you a winter filled with the warmth of family, friends and, of course, great culinary adventures. Bring broth to simmer in medium saucepan. Heat oil in a large heavy saucepan over medium heat. Add pancetta and cook until crisp, stirring occasionally. Using slotted spoon, transfer bacon to paper towels to drain. Add leeks to drippings in pan, and cook 4 to 5 minutes until soft, stirring occasionally. Add rice to pan and stir for around 2 minutes. Add wine, and stir until absorbed, about 2 minutes. Add 1/2 cup warm broth to the saucepan, and stir until absorbed. Repeat, adding broth and stirring constantly until rice is tender, but still firm to bite, and sauce is creamy, around 25 minutes total. Add asparagus tips, if using, in the last 10 minutes.